Want to visit one of the lower 48’s largest wildlife refuges? Now you can. Above: The Sevilleta Wilderness. Photographs by Stefan Wachs. I STOOD ATOP A MESA in central New Mexico, rugged mountains looming to the west, a lush river valley below. The lights of cars and trucks traveling the ribbon of I-25 winked on as the sun set. I knew that in the growing darkness it would be difficult to find my footing coming down off the mesa, but I couldn’t bring myself to leave, afraid I might miss something important. A sudden sense of gravity, entirely new to me, seemed to emanate from the rocks and plants, the gathering stars, and the slight evening breeze. Finally, regretfully, I picked my way down the steep path. It was my first day working an area I would come to know well. Many years later, that sense of awesome namelessness remains, long after I first arrived in Albuquerque to begin working at the Sevilleta Long Term Ecological Research Project, in the Sevilleta National Wildlife Refuge. Located about an hour south of Albuquerque and not quite cut in equal halves by the Río Grande, the refuge corrals a staggering 230,000 acres, a significant portion of which is Chihuahuan Desert grassland. The Chihuahuan Desert is a biome—a regional ecosystem, this one characterized by the plants and animals one might expect in a desert. I quickly came to respect tough vegetation that can handle weeks without moisture, including black grama grass and creosote bushes, and creatures like desert box turtles, which burrow into the ground for long stretches, waiting for a little rain. The Chihuahuan Desert stretches south well into Mexico and hits its northernmost extent near the refuge. But the Sevilleta encompasses much more than Chihuahuan Desert. A meeting of ecological boundaries is part of what makes it a special place, one that’s home to an array of species that may not cross paths elsewhere. Here’s a thumbnail Sevilleta biome map: Sweeping down to meet the Chihuahuan Desert is the southeastern extent of the Colorado Plateau Shrub-Steppe, an open, windblown biome known for low-lying vegetation such as ring-shaped blue grama grass, fishhook cactus, and prickly pear. Reaching its western terminus on the east side of the refuge is the Great Plains Shortgrass Prairie, characterized by a rich diversity of grasses and flowering plants, a habitat well suited to Gunnison’s prairie dog. Small herds of pronghorn and even a handful of frighteningly horned oryx—descendants of animals brought from Africa—roam across these varying landscapes, finding no need to be overly mindful of ecological labels. Above: Deepen your knowledge of the Sevilleta in its recently revamped visitor center, then head out on trails ranging from easy to exhilarating. On the northeastern side of the refuge, the 7,000-foot Los Pinos Mountains jut up, towering an impressive 2,000 feet over the grass- and shrublands. Here, temperatures are cooler and more rain falls. More snow, too. These are the ingredients for iconic piñon-juniper woodland, frequented by bears and bobcats. At the refuge’s western boundary, the rugged Sierra Ladrones begin to climb imposingly, the piñon-juniper foothills giving way to rock-strewn terrain traversed by mountain lions and desert bighorn sheep. And let’s add the Río Grande, a steady source of water in a landscape where moisture is never predictable. With the river come cottonwoods, willows, amphibians, fish, and, of course, the countless sandhill cranes and snow geese that draw thousands of visitors to the nearby Bosque del Apache National Wildlife Refuge every fall. 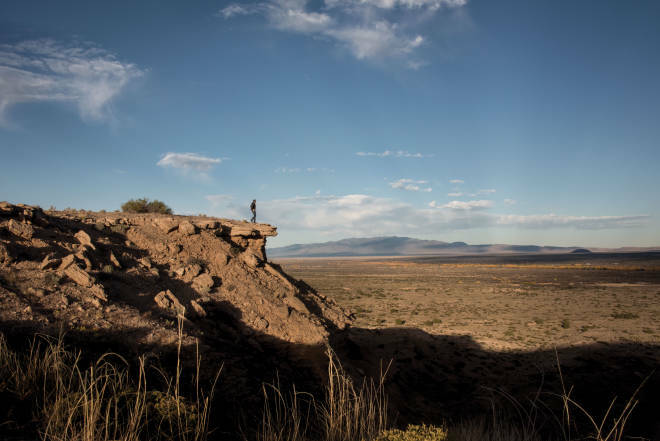 But here on the Sevilleta is where four of New Mexico’s major biomes meet dramatically, not far from the geographic center of the state, right in the midst of its most well-known river. Drivers on I-25 between Bernardo and Polvadera may be unaware that they’re surrounded by such a bountiful treasure of natural history. Yet even intrepid travelers who’ve exited the highway to explore this landscape may have found themselves stymied by fences, gates, and a forbidding solitude. Today, thanks to the refuge’s efforts, there’s no reason for the curious to be confined to their cars. 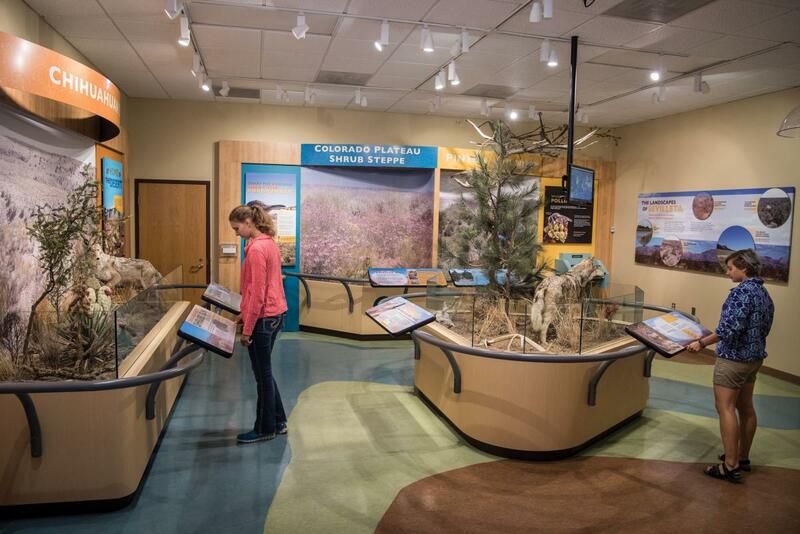 A recently revamped visitor center provides information on the refuge and its unique cast of plants and animals, as well as refreshments and maps of new trails that allow an up-close look at this often challenging desert environment. STORIES ABOUT THIS PART of central New Mexico often begin with Juan de Oñate, the Spanish conquistador who, in 1598, crossed the Río Grande and came north. He was searching for a city of gold, of course, but what he found instead was an extensive and sophisticated Puebloan culture all along the fertile riverbank. These were Piro Indians, and Oñate’s soldiers named the pueblo nearest to what would become the refuge Nueva Sevilla, because the landscape reminded them of the river plain back home in Seville, Spain. (The Piros themselves called it Seelocú; it later became Sevilleta.) Then came eight decades of tumult. With the Piros’ numbers steadily dwindling, they scattered during the 1680 Pueblo Revolt and never returned. Even the large pueblo of Socorro was deserted and in utter ruin for more than a century. It wasn’t until 1800 that people truly began to resettle the area. The Treaty of Guadalupe Hidalgo transferred control to the United States, but occupants of an old Spanish land grant, Sevilleta de la Joya, retained their property rights. During the Civil War, the storied Confederate retreat following the Battle of Glorieta Pass marched through the western portion of today’s refuge, a dry, unforgiving terrain that pummeled the soldiers. Rumors of hastily buried cannons lying undiscovered in the usually dry bed of the Río Salado persist to this day. Then, in 1928, Socorro County bought the land grant in a public sale, a result of the community’s unpaid taxes. Future Air Force General Thomas Campbell, a Montana farmer known as the “World’s Wheat King,” acquired the sprawling acreage in 1936. Above: The Sevilleta blends sweeping mesa views with desert-hardened plants that can survive long dry spells. For 30 years, the Campbell family ran an expansive cattle and sheep ranch. I have occasionally stumbled on the remnants of their operation—a collapsing adobe building, weathered truck chassis, or pile of rusted tin cans. But in 1966, Campbell decided he wanted to create a legacy that would live on after he was gone. He established the Campbell Family Foundation, aiming to allow all the land to return to a state mostly free of human influence and thus move unimpeded through the natural processes of ecological regeneration. This also meant that, as a general rule, there would be no public access. An allowance was made for scientific study by educational institutions and conservation organizations. Scientists from all around the world, along with UNM, New Mexico Tech, and NMSU, perform research on the refuge, often designing elaborate long-term experiments. In the end, the foundation concluded that the best way to achieve its goals would be to have the land designated a national wildlife refuge. In 1973, the property was gifted to the Nature Conservancy, then turned over to the U.S. Fish & Wildlife Service. Today, 45 years on, the general’s wishes still guide its management. GIVEN THE SEVILLETA&apos;S immensity, you’ll find mile upon mile of fence line, as well as numerous gates, all of them locked tight. There is one way in: take exit 169 off I-25 and drive a short distance west to the Sevilleta Visitor Center. Walk inside and stop at the front desk, where you may be met by visitor services manager Jeannine Kimble. She’ll tell you about the nearby exhibition room, whose theme is “Bringing the Outside In.” “We want people to be able to learn something about the landscape, even without necessarily visiting that landscape,” she says, in recognition of the sometimes less than gentle environment of central New Mexico. “We have numerous interactive exhibits, sounds from the refuge, maps, and wildlife photos taken at our drinkers—the artificial water sources we maintain for the animals.” There’s also a six-minute animated movie to get oriented. After that, head outside to the three nearby trails. At a quarter mile, the Wildflower Loop is the closest and shortest trail, a paved path from which one can see mountain ranges in nearly every direction, look out over the Río Grande Valley, and, season permitting, view native wildflowers. Just to the south is the 1.1-mile Nature Loop, which goes down into an arroyo and back out again. Lizards, rabbits, coyotes, and deer are all known to make appearances. My favorite trail is Mesa View; I’ve hiked it countless times, and its apex is where I first encountered the ineffable quality of the desert at evening. But when I arrived at the refuge, this rugged 3.8-mile loop wasn’t even an option—it was built in 2012. Continuously marked by stones, it’s a true desert experience, climbing the tall mesa above the visitor center and adjacent UNM Sevilleta Field Station. 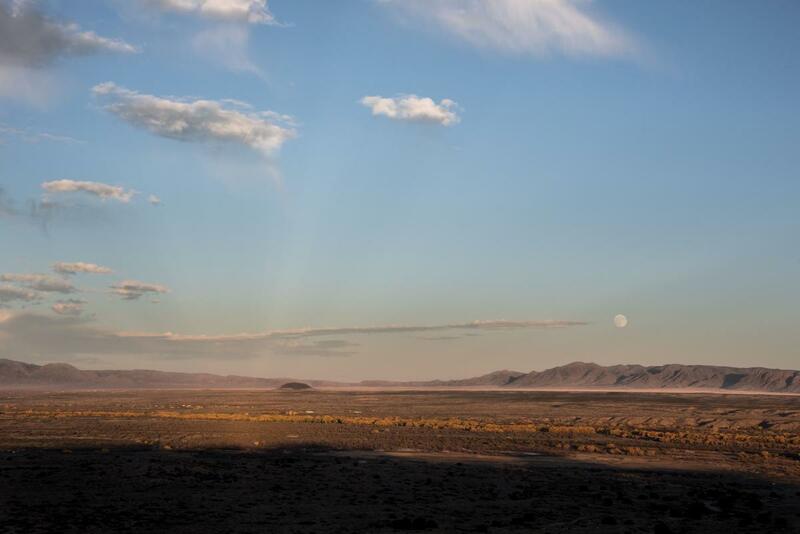 In the southern distance, the spectacular Magdalena Mountains reign, and, 15 miles or so to the east, the Los Pinos are visible, clear across the entire refuge. A bench waits on top—a chance to take in the gravity of it all. The Sevilleta National Wildlife Refuge Visitor Center is open year-round, 8 a.m.–4:30 p.m. Monday–Friday. Outside of those hours, visitors can park at the entry gate and walk to refuge trails to enjoy a sunrise or sunset. Celebrate Sevilleta Week occurs in mid-October each year and includes activities that teach people about the refuge and its various biomes, as well as some of the scientific research being done. Always on the schedule are trips to far-flung places with ear-catching names like McKenzie Flats and West Mesa.